Lowdown: The varieties of religious experience. 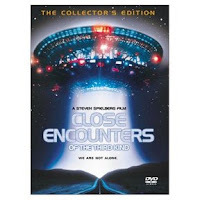 Surprisingly for a Spielberg fan, I only watched Close Encounters from start to finish once. It was when I was 11 or 12, in an after school thing I took part in dealing with science fiction at a time in which films were extremely hard to watch once they were off the cinemas. Since then I never saw much appeal in Close Encounters: there was no action or anything else to attract me to it. However, years went by and from time to time thoughts crept into my head regarding the film. Mainly, what the [insert profanity] did Spielberg aim at with this film? The story is fairly easy to follow. It starts with all sorts of weird phenomena taking place all over the globe - planes disappearing, ships showing up in the middle of a desert. Francois Truffaut, the deceased French director - one of those film makers I always look up to - plays a French researcher investigating those. Then it moves on to different people in the USA (why?) who sight UFO's, focusing on Richard Dreyfuss. The film moves on to show how these people handle their experience, eventually culminating in an encounter between humans and aliens (oops, spoiler). Well, what did Spielberg mean with that? After watching the film again I think I can safely say that Spielberg wishes to discuss the religious experience. When we pray to god for something, we are in fact asking for a miracle, a deviation from the standard way in which nature goes about; those missing planes and ships in the desert constitute that. And then the various people who encounter the aliens, which the film follows, they all experience things of the type that caused many a religion to come into being; and they also experience revelation, which is usually the basis of religion (especially as no religion can be substantiated by simple stuff such as verifiable facts). The film's aliens take upon themselves the role of god; I think it was Arthur C Clarke that said that if one culture encounters a civilization much more advanced than itself it would think it met god, which stands to reason; just think how a person from 200 years ago would react to a mobile phone. I therefore speculate that Spielberg used the film to tell us something about the religious experience, where it comes from, and how he thinks it should be handled (my interpretation of the film is that Spielberg is a warm admirer). The aliens themselves are nice and poetic, at times, but at the end of the day the film is not about whether to believe in UFO's or not; it's a film where the UFO represents a way for us to feel at one with the universe, a need we usually tend to nurture using the invention of religion and god. Having concluded the above, the next question is whether I like the film. Well... it's nice and it's entertaining, but it's not that spectacular; I can see, in retrospect, why I always considered this to be one of Spielberg's lesser films, even though it's clear it is a cornerstone film for Spielberg and even though it is regarded as a science fiction classic. Best scene: Dreyfuss collects items from all over the neighborhood to build a replica of the mountain conveyed to him in revelation. It's a funny scene, but the way his neighbors react to his obvious lunacy makes me think how we would react if one of them biblical prophets was to turn up on our doors now; they'd find themselves locked in an asylum in a manner of minutes. Picture quality: This special edition double disk release obviously went through much effort. There are no digital compression artifacts to talk about, but the picture shows its age. Sound quality: Again, very dated; you know this is a film from 1977. That said, the soundtrack features a pretty aggressive surround soundtrack. It's old, but it packs a punch. Thanks for reaffirming vague memories.